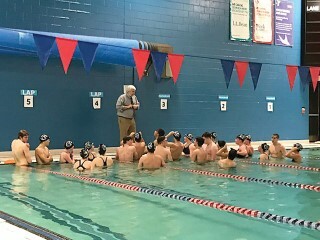 The Christmas break was a busy time for the Windham Eagle's Swim Team. The meet against Sanford on Saturday, December 23 was postponed due to weather. The day after Christmas was an exciting meet at the Morse Invitational. This was an opportunity to swim against some of the best in the state. Windham had a great meet with some very competitive times. Congratulations to Dominic Agneta who qualified for states in the 50 free swim with an amazing time of 26.27 seconds. On Friday, December 29, Windham had a tremendous meet against Massabesic at the Biddeford Y. The swimmers were on high energy and there were a number of swimmers who qualified for States. Congratulations to Sophie Simonson who qualified for the 200 free, Dylan Palmer qualified for the 200 individual medley (IM), and Simon Gabaree qualified for the 100 butterfly. The girls 400 free relay team of Sophie Simonson, Elizabeth Lucas, Katharyn Lucas and Hannah Maurais had everyone on their feet shouting and cheering them on to their 10/100 of a second victory over Massapesic. Windham boys won the meet with a comfortable margin of 88 to 64, the girls also won with a close race of 73 to 69. Congratulations to all the swimmers - their energy and enthusiasm was palpable. The next meet will be Friday January 5, against Scarborough at the Cape Elizabeth pool.